On the 26th anniversary of the Babri Masjid demolition, Hindu saints and seers feel betrayed by BJP, while Muslims sense hatred in the air. The disputed temple town of Ayodhya has been turned into a virtual fortress on the 26th anniversary of the demolition of Babri Mosque, but people from both the communities are not happy with the developments on this issue. While Muslims have been observing December 6 as ‘Black Day’, Hindus see it as ‘Shaurya Divas’, ever since the demolition. But, this is the first time in the history of last 26 years that even the Hindu saints and seers closely associated with the Ram Temple movement are not happy. Mahant Paramhans Das, who has been fasting with the demand to start the construction of the temple, was arrested and sent to jail by the Ayodhya police last Tuesday after he threatened to set himself on fire on a pyre on December 6. Before his arrest, Paramhans Das told this reporter that the present Bharatiya Janata Party (BJP) government had back-stabbed Ram devotees for votes and that the saffron party would face the ‘curse’ of seers on this. “The saints have been supporting the BJP since the demolition of the mosque and all on occasions (elections), we have asked our followers to vote for the party and bring them to the power. But, today we have been asked to have patience and wait for the Supreme Court judgement,” he said, adding that no one now actually cares about starting the construction of temple. “Satta ke nashe mein sab andhe ho chuke hai. Ram Lalla ki chinta kisi ko bhi nahi bachi hai. Ab chunaav nazdeek a gaye hai to Ram ke sapne aane lage hai sabko,” said the saint. (Intoxicated by power, they have become blind. No one cares for Ram Lalla. Now that elections are nearing, they have started dreaming again about Ram). Acharya Satendra Das, who is also the main priest appointed by the court of the Ram Lalla temple, said people have been fooled by every government, and every believer of Ram was being fooled in the name of starting the temple construction. “Neither Congress nor BJP want to actually start the construction of temple. The temple would have been built and this dispute could have been solved long ago, but people see this as a very big political plank. I am telling you that politicians have no faith in Ram,” Das said with tears in his eyes. The chief priest also said that people who have done politics in the name of Lord Rama should observe December 6 as a ‘Black Day’ and offer their apology to the deity for using his name for their vested interests. Even BJP bosses are making it clear that their party is not thinking of bringing an ordinance over the issue, so people should now understand how serious this government is about constructing the temple, Satendra Das said, reacting to the statement by Kailash Vijayvargiya on construction of temple. Iqbal Ansari, 52, the petitioner from the Muslims’ side, while advocating peace, said justice should be done with his community. 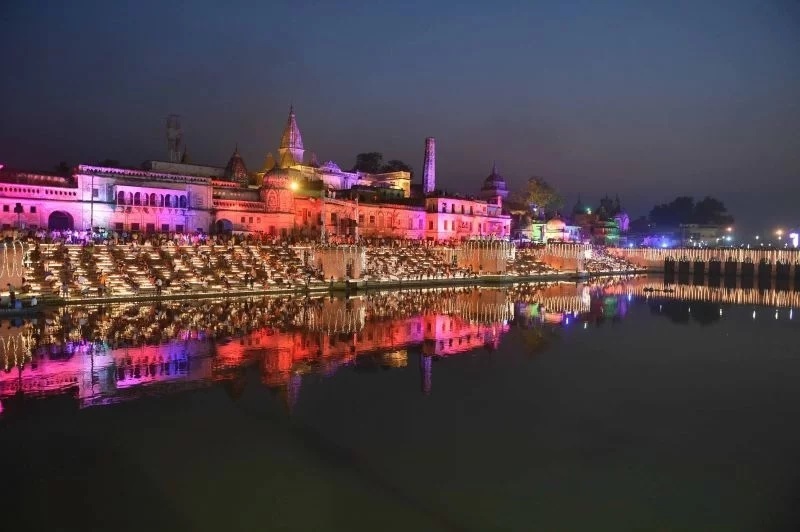 “The environment of Ayodhya was good and communal harmony was at its best even after so many years of the demolition. But, these days there is more hatred in the air than ever before. Today, we (Muslims) cannot even observe Black Day as we live in a fear that someone will come and make an issue out of it,” he added. “We do not even have the right to mourn on this day. Our mosque was martyred, our men were killed and still we cannot claim a mosque on the disputed site,” Ansari said, adding that Muslims of the country had given their consent for constructing the temple, but a very small piece of the land could also be given to Muslims. “After all, every citizen of this country has his/her right to preach,” he added.